THE PROBLEMCreatives have a commitment to integrity in their work but are simultaneously constrained by the pressures of time and project demands. This can cause frustration and creative blocks. The Operator provides an outlet for creatives to escape the frustration of a problem and connect with outside inspiration. Below, Kristin uses The Operator. After our first round of prototyping and programming, three things happened—(1) Arduino received input from the dial of the phone, (2) Arduino talked to Processing and (3) Processing played a sound when a number was received. The video below provides a brief talk and demo through this process. 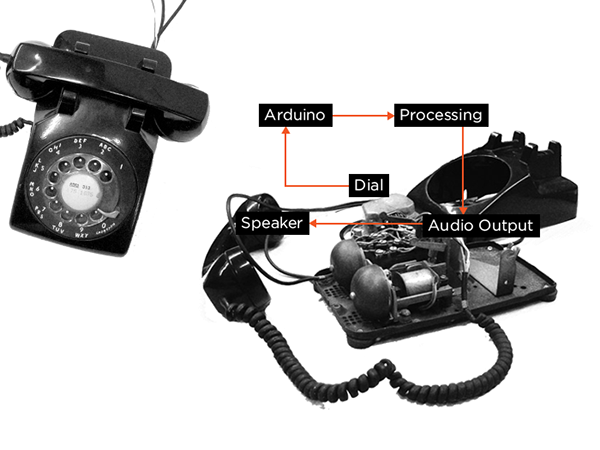 The final prototype uses this basic setup, but additionally allows the user to dial a seven digit phone number and receive a voice message through the telephone headset. 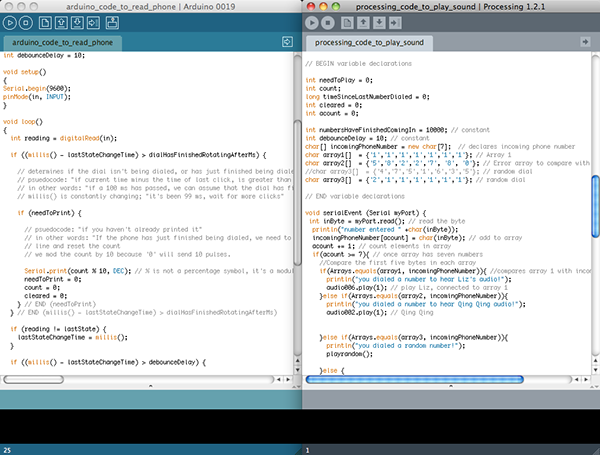 Sample Arduino and Processing code is shown below the video.